During the winter, Twillingate Newfoundland is a sleepy, iced-in fishing village. 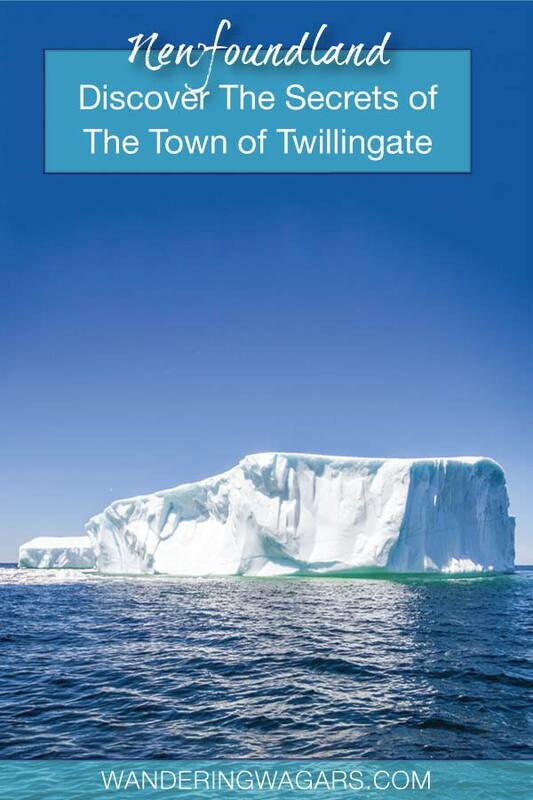 But during the summer a visit to Twillingate becomes one of the hottest things to do in Newfoundland. 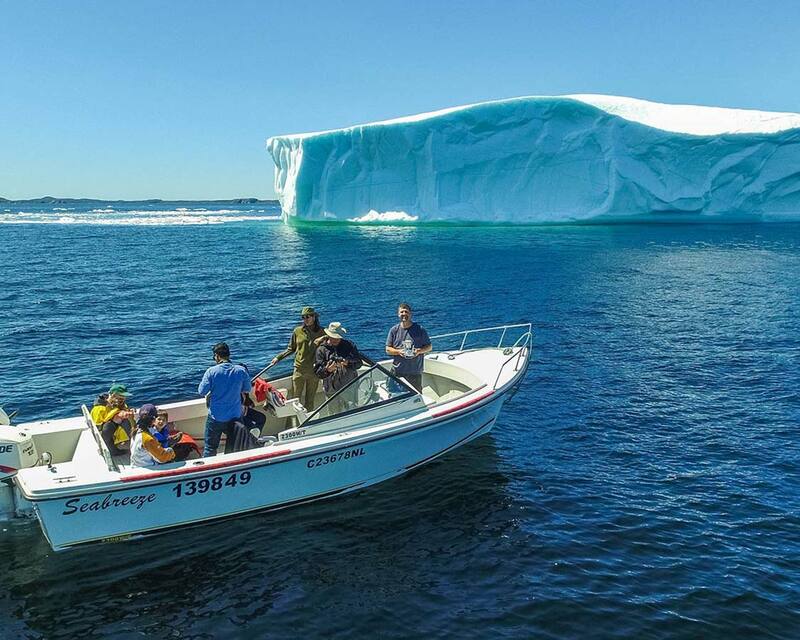 From mid-May on, the Twillingate Iceberg tours launch in full force, and there are few better places in the world to experience small boat tours of Icebergs than the town of Twillingate. We would soon learn that iceberg tours aren’t the only things to do in Twillingate Newfoundland. We had spent the day before getting our first glimpse of these icy art forms in St Anthony in Western Newfoundland, but this experience would be something truly spectacular. Twillingate is situated at the top of central Newfoundland. For those traveling from the west, its about a 425 km (264 mile) drive from Rocky Harbour to Twillingate. For those traveling from the capital of St. Johns, its an easy 444 km (275 miles). We had spent the previous few days exploring the Newfoundland Viking Trail, so we were traveling from the west. It was a long but easy jaunt along the Trans-Canada Highway (Highway 1), and after leaving Rocky Harbour and Gros Morne, National Park the scenery definitely took a turn for the average. This all changed, however, in the last 100 km of our journey. We left Highway 1 and drove on Route 340 N towards the Road to the Isles and the final stretch towards Twillingate Newfoundland. This section of the journey was breathtaking. The highway snaked between quaint fishing towns, skipped across the ocean from island to island covering many bridges and causeways. The weather, which had been brilliant throughout our trip, was continuing to co-operate. The sun shone brightly over the glistening bays. 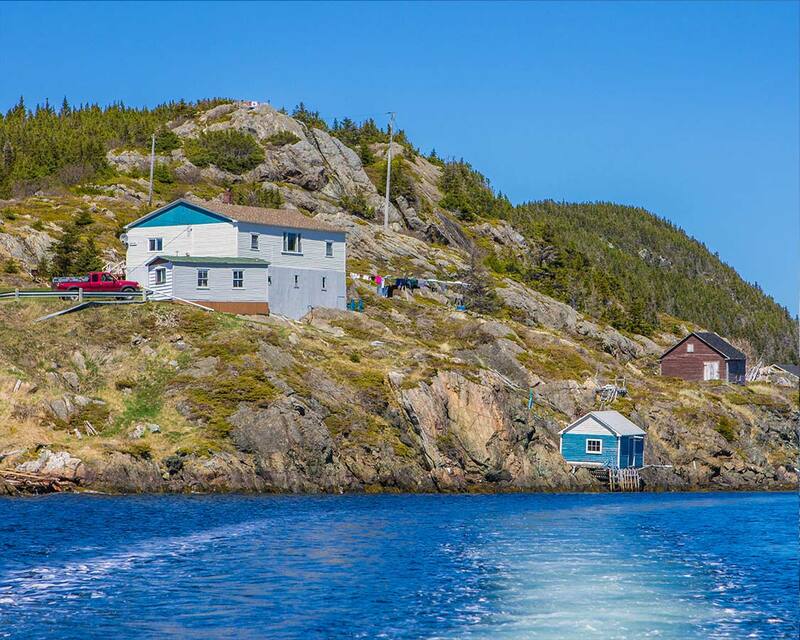 As our backs began to stiffen from the drive, we all cried out in joy as we rounded the bend towards the town of Twillingate and caught sight of Prime Berth Fishing Museum, the home of Captain Dave’s Boat tours. Because of Twillingate’s position in the center of Newfoundland, it’s a popular destination for both tourists and locals alike. And Twillingate has embraced this popularity. 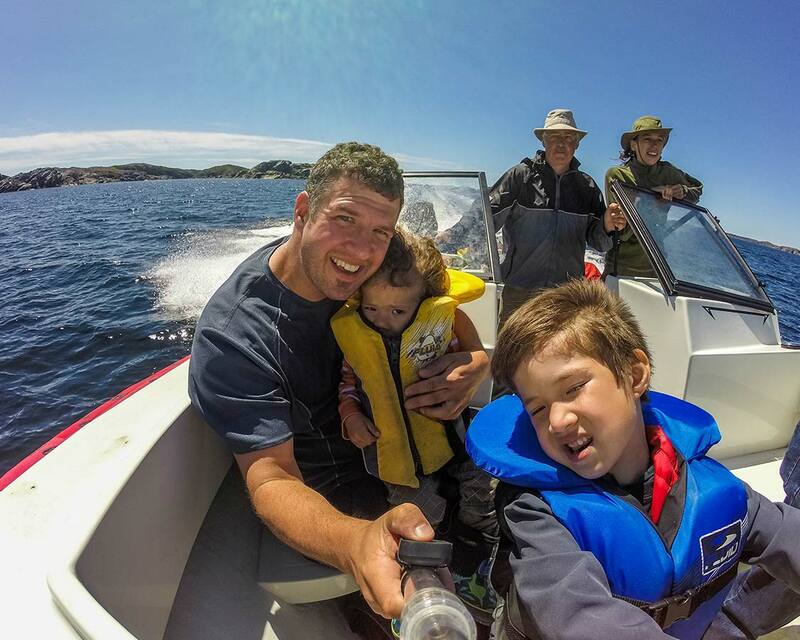 There is a wide offering of things to do in Twillingate that will satisfy both solo and family travelers alike. The drive up to Twillingate alone makes it worth the journey, but once you get there, the excitement really gets started. 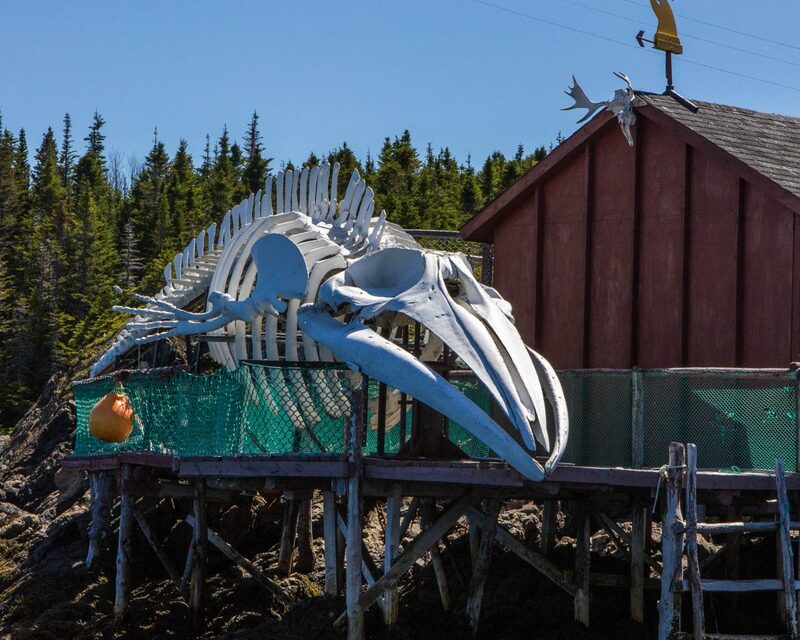 Here are a few of our favorite things to do in Twillingate Newfoundland. 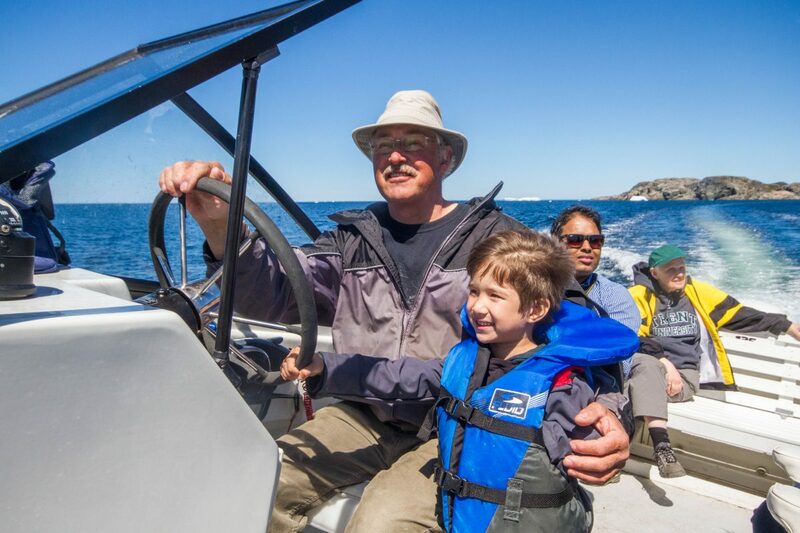 Captain Dave is a longtime fisherman, teacher, and boat operator in Twillingate was our first choice for a Twillingate Iceberg Tour. In researching Iceberg tours in the area, he was one of the few small boat operators. And Captain Dave’s passion for the region, it’s ice-cold weather, and yearly visitors was evident in everything he wrote online. Christina and I had been following the Newfoundland Iceberg Reports Facebook page closely, and Capt. Dave was a regular contributor each day, showing off all the beautiful bergs he had witnessed that day, and describing each location and detail in earnest. Capt. Dave tracked down some kid-sized life jackets for the boys and we jumped into his motorboat and headed out to Main Tickle (A tickle, in Newfoundland, is a narrow salt-water strait, as in an entrance to a harbour or between islands or other land masses, often difficult or treacherous to navigate because of narrowness, tides.). I was a little nervous about how the boys would handle being in a small boat again after our disaster in Bermuda, but C ran straight to the front of the boat and was all smiles with the wind in his hair. D took a little longer to warm up to the idea, choosing to stay in my lap for the first while until he found his sea legs, but once he got used to being on the water, we couldn’t keep him still! 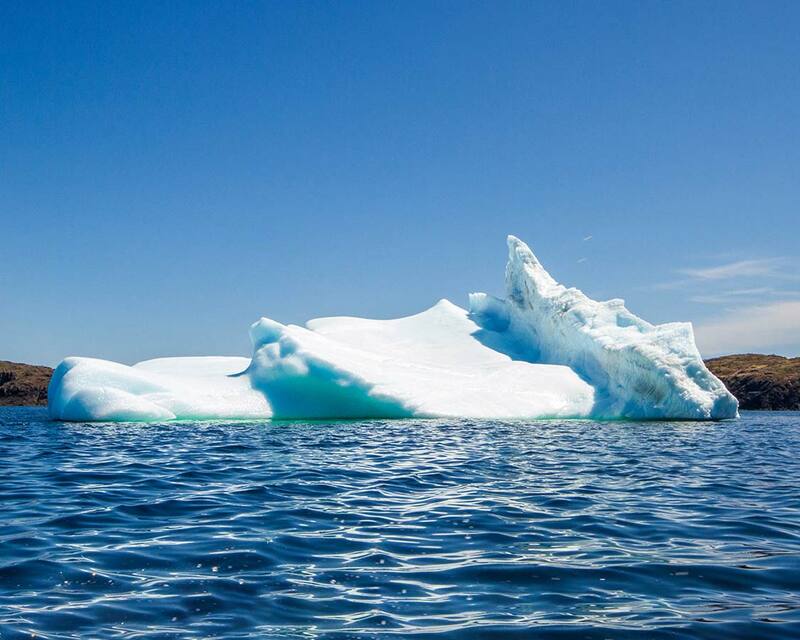 It wasn’t long before our Twillingate Iceberg Tour had us catching glimpses of “bergy bits” (bits of ice that have calved off of larger icebergs) floating around us, and soon we had reached a large wedge berg surrounded by a sea filled with bergy bits. Capt. Dave was nice enough to let me pull my drone out for some video and we got some great shots, much to the thrill of everyone else in the boat, especially my Mom who had joined us on our Newfoundland adventure. Pro-Tip: The largest iceberg ever reported was over 50 m. in height and over 6,500 m. sq! It was awe-inspiring being so close to one of these icebergs, and this one, at about 15 metres tall and 60 metres long was actually fairly small when you consider that they can reach sizes of over 50 metres in height and a diameter of well over 1000 metres sq! We circled around and found a very cool looking pinnacle berg so we buzzed over to get up close and personal with it. The brilliant blues of the pure ice seemed to glow from the depths of the ice. On Capt. Dave’s next outing, the beautiful berg below calved and fell to pieces into the ocean. This must have been such a thrill for him and his passengers to see! Pro-Tip: Icebergs are known to roll and calve suddenly and unexpectedly. Rolling means the iceberg flips over suddenly. Calving means that the iceberg breaks apart into pieces creating bergy bits. It’s important to keep your distance from icebergs for this reason. 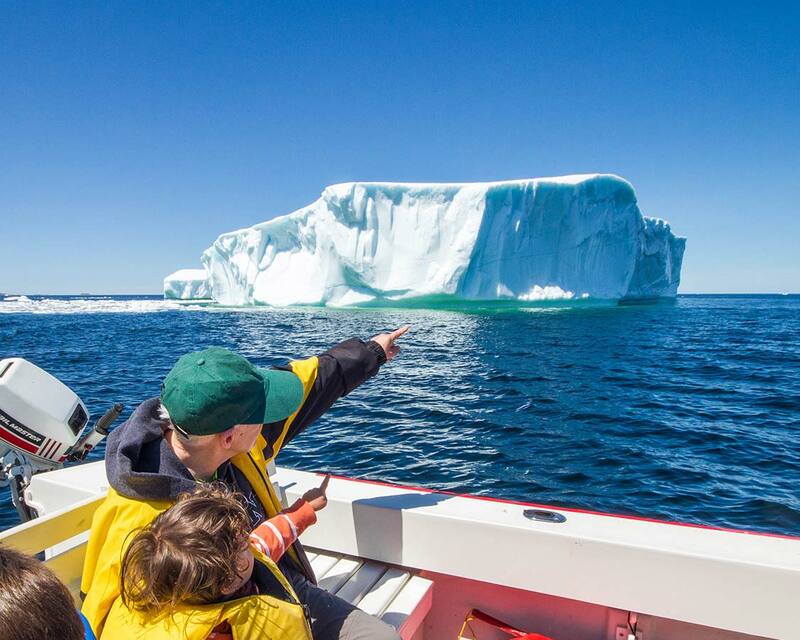 After getting up close and personal with icebergs in Twillingate, Capt. Dave turned us around and took a long route through some Newfoundland tickles (Our Iceberg Tour included exploring the Tickles, not all of them do, so check ahead of time). Heading through these narrow rock splits gave us an intimate view of the local fishing villages and the surrounding culture. 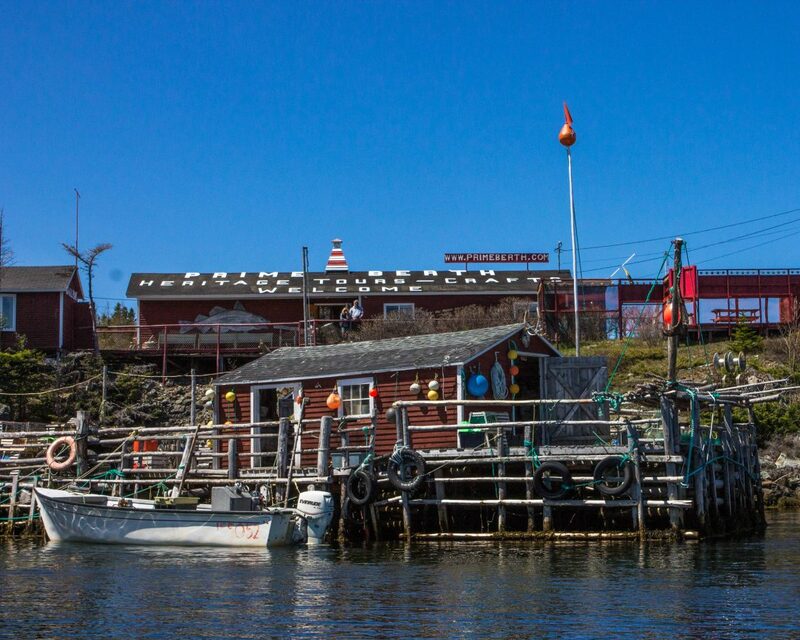 The coast was dotted with quaint fishing sheds and boats lined up and ready now that the ice was receding. The area is often full of birds, including gulls, terns, gannets, and puffins. Seals also can often be seen basking in the sun. We were lucky to catch a glimpse of one seal, but unfortunately, the cute little guy wouldn’t stay still long enough for a photo. Pro-Tip: A Tickle is a Newfoundland term is a point between two rocks which you can get a boat through. Captain Dave was absolutely amazing with the kids. He was attentive and helpful with C’s constant, curious questioning, made sure that the boys each got opportunities to take in some of the close-up views, and even let C take a turn at being Captain. I learned that he used to be a teacher, and that was added to a long history of jobs within Newfoundland, including fisherman, tour guide and museum curator. 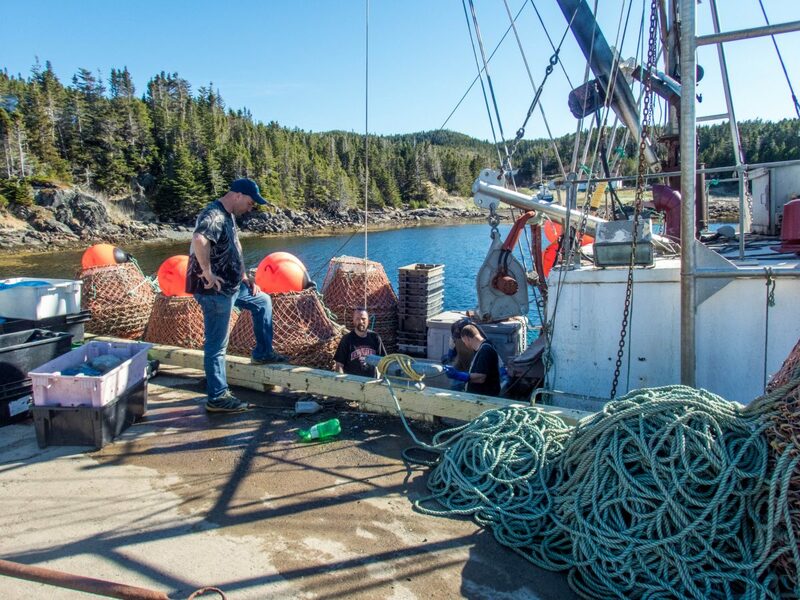 Because we were involved in such a small, intimate iceberg tour in Twillingate, we were able to experience a little of the local fishing life that makes Newfoundland so incredible. Captain Dave stopped in to check on some of his personal lobster traps. As we pulled up alongside the lines, the boys eagerly ran to the edge of the boat to catch the action. Maggie a super-cool traveler from Kingston, who had joined the tour was tasked with pulling up the traps and checking the lobsters. This small boat experience was great watching how the traps are manually hauled up onto the boat. 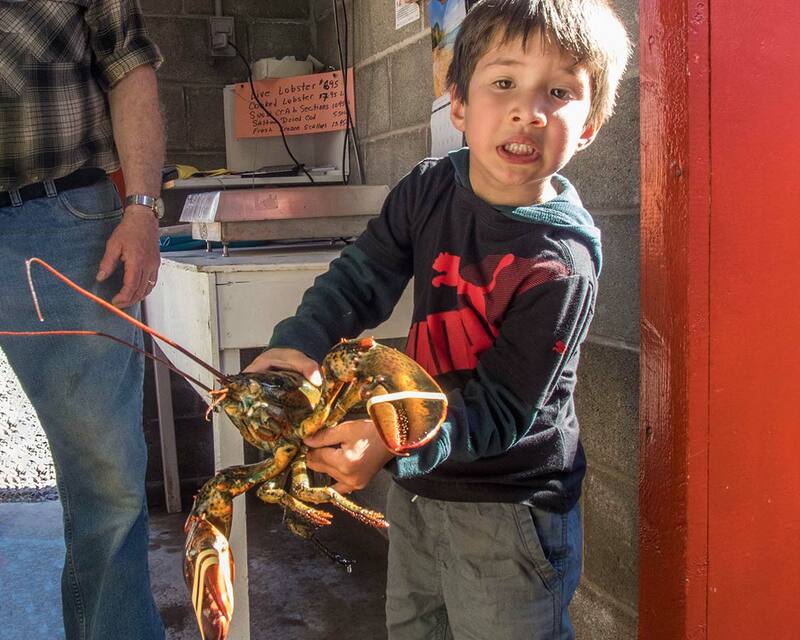 Each lobster is checked for size to see whether it is an option for that night’s dinner. C inspected them both closely while Maggie held them and they both agreed that one, which was covered in eggs, should be thrown back, while the other was too small and should be left to grow into a more mature lobster. The pair were lowered back into the water and left to go on their way, while we pointed our nose towards the Prime Berth Fishing Museum. Captain Dave and his wife also curate the Prime Berth Fishing Museum where his tours launch from. The Prime Bert Fishing Museum place is a unique mix of cool, antique fishing gear, old fishing sheds, some of which were hauled from their original locations across the water to the museum, and quirky and hilarious mannequins offering examples of the different aspects of a fishers life and work. The place has amazing character and the boys were fascinated by the displays of whales baleen plates, shark jaws and most especially, the skeleton of a Sai Whale. The whale had been found beached on the shores of Newfoundland and was towed by Capt. Dave to the museum for display. The kids had a great time literally climbing inside a great whale! After saying goodbye to Captain Daves Boat Tour and the Prime Berth Fishing Musem, we headed deeper into Twillingate to explore this beautiful village. Like pretty much every town in Newfoundland, fishing is at the heart of Twillingate, but at the peak of the Main st in the town lies something unique. 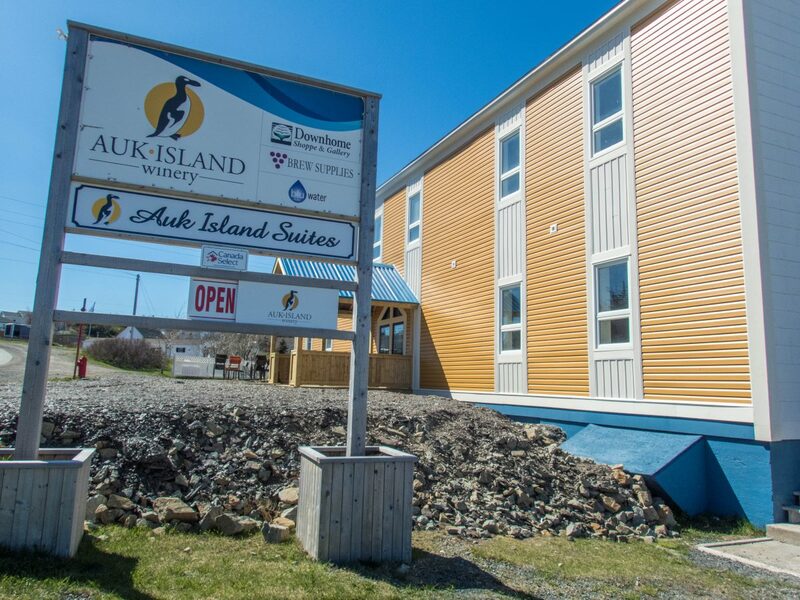 The Auk Island Winery is one of only two wineries in Newfoundland. Since Newfoundland is not a province that is friendly to grapes, the Auk Island winery makes its wines entirely with local varieties of fruit. While fruit wine isn’t uncommon, it’s far from unique. What makes Auk Island Winery so special is the water that they use within many of their best wines. Greenland’s glaciers are date back over 10,000 years, making the ice that has arrived in Newfoundland and Labrador some of the purest water available. The Auk Island Winery harvests these icebergs and uses the pure, clean water as the base for many of their delicious wines. After tasting some delicious Auk Island wine, we headed towards nearby Hillgrade for some dinner. The area is home to a small fishing pier where many of the crab and lobster fishers embark early in the morning before bringing the day’s catch back to the pier. 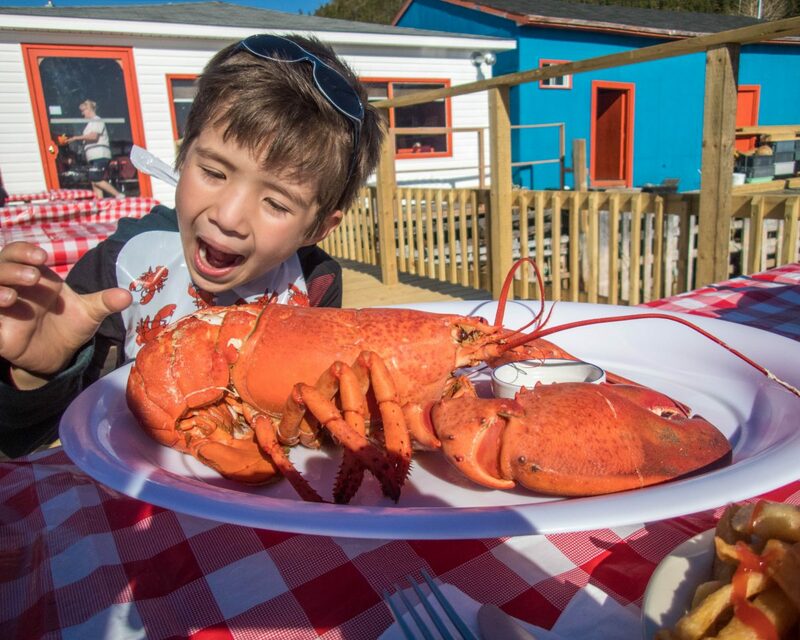 Those fisherman drop the best of the lobster catch into the Lobsters pool at Doyle Sansome & Sons Lobster Pool. D had passed out hard after our boat adventure. 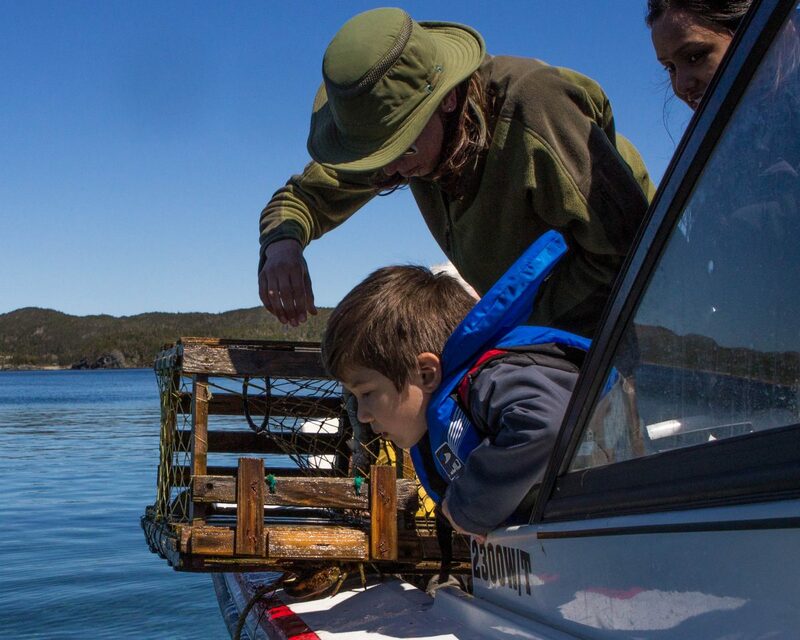 Luckily for us, my amazing Mom, who had joined us on our Newfoundland adventure, needed a break herself and opted to wait with the D-man in the car while we checked out the pier and the famous lobster pool. C was fascinated by the pool full of lobsters that were separated by sizes. He was quick to point out the largest ones he could find. The staff at the restaurant were incredible. They even took the time to pull out a lobster and teach C about the anatomy and feeding styles of these cool crustaceans. Because of the beautiful weather we opted to sit on the Doyle and Sansome patio. Here we had a great look at a small iceberg that had become wedged on the shores across the tickle. The clear waters let us watch the hundreds of fish that swam in the shallows below the patio. Across the water was a group of crab fishermen preparing their boat for the next day’s outing. All in all, it was a perfect way to spend the end of our day. D finally woke up allowing he and my Mom to join us just as dinner arrived. We shared a lobster, who I had ensured C did not name. We also shared some amazing crab spring rolls that you absolutelyneed to have if you visit Doyle Sansome & Sons Lobster Pool! The food was incredible and was the perfect way to cap an amazing four days in beautiful Newfoundland. Newfoundland captured a piece of our heart. As we drove toward Deer Lake for our flight home the next day we were already planning our next visit. Newfoundlands Iceberg Alley has a number of incredible places to view Icebergs beyond Twillingate and St. Anthony. Our friend and fellow traveler Chris Rudder from Rudderless visited nearby Fogo Island and between the amazing inn and the incredible food, shows a whole different perspective on exploring Newfoundland. This is the most amazing trip ever! I can not wait to do this with my kids – and soon!! I love the icebergs- will share this to Frank on his Facebook! He is dying to go to Newfoundland! You should! It’s such a great place, so unique in Canada! It looks like C is a natural sailor! Maybe there is a budding marine explorer in your group! It is great that you were able to use your drone as well – such great photos! This seems like such a lovely family outing! I am yet to see an iceberg myself so this would definitely be a great place for us to visit too. The kids look like they had a great time from the photos and the scenery is just gorgeous. This looks so cool *no pun intended*! I was actually looking forward to seeing glaciers this year. Hoping to kayak and get a closer look when I visit Glacier National Park! Love this! I had planned on going to Newfoundland back in May but ended up exploring Nova Scotia instead… Very jealous of the iceberg sighting!! This looks amazing. I want to share it with all my friends who don’t know where to travel with kids. This looks awesome! Definitely have glaciers on my bucket list! Lovely post, and can see you had a great time with icebergs and lobsters. I loved the video too. Thanks for sharing. Great to see that the place is also set as kid-friendly destination. 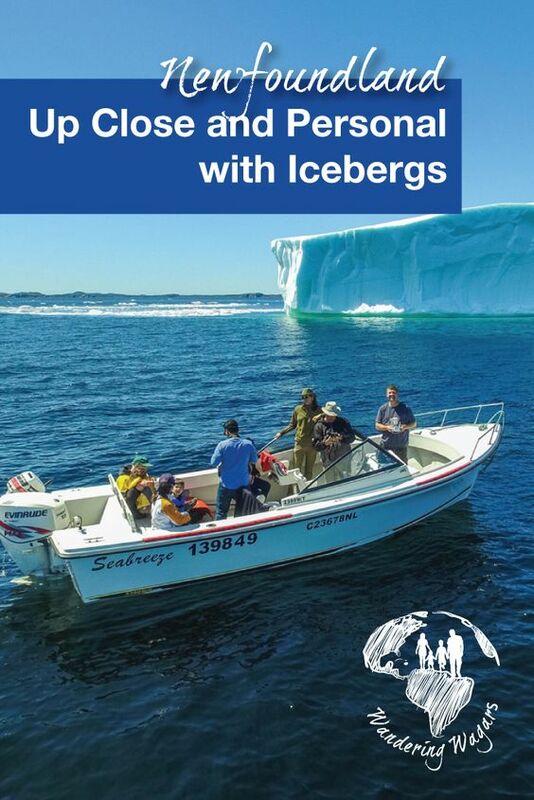 Icebergs and lobsters, what a cool mix of adventure is that! What an amazing and educational day! The last lobster with C looks huge. Bookmarked and hope to bring my family for a trip there too! Wow those icebergs look unreal!! and those crab spring rolls sound so so good. Didn’t realize this post about icebergs was going to make me hungry haha. Looks like you guys had an amazing time! I hear you when it comes to little ones passing out on travel adventures. Great post! This is just such a different experience. I loved reading about it. 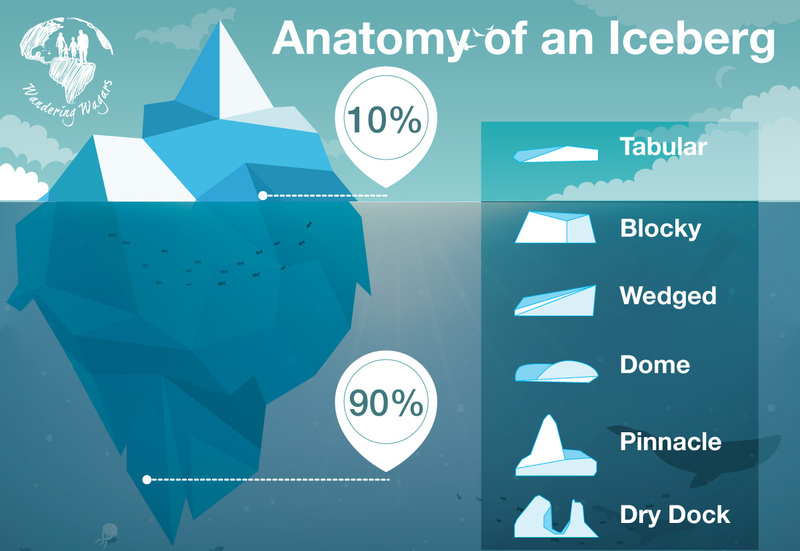 I did not know about the iceberg splitting. I would love to do lobster fishing and yes, I would love to get close to an iceberg, just to see it for myself. Enjoying great family vacation. I would suggest you that you can do family vacation in india, you will see different culture and food at every corner of india.